In one of the most beautiful seaside resorts on the Atlantic Coast, the En Chon Les Pins Campsite is perfectly located to visit the surrounding area and discover the natural and cultural heritage of the Landes. Have a wonderful holiday in the green and lively Landes forest. You are also right next to the sandy beach under the pine trees of Lac Nord de Biscarrosse, ideal for bathing, water sports and perfect for children. It’s most famous as a market town, full of independent shops and an unmissable Friday market in the recently-refurbished Place de l’Eglise. There is also a small market on Sunday mornings next to the Château de Montbron, home to the Count of BISCARROSSE: Bernard d’Antin de VAILLAC. 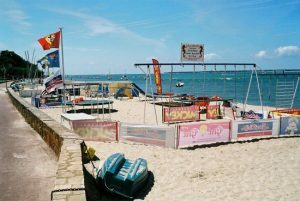 You will also be amazed by the liveliness and ‘joie de vivre’ found every evening in the superb night markets by the sea. Finally, the campsite is surrounded by superb destinations for a day trips into the Landes to soak up the sunshine and explore beautiful places. A SMALL, PEACEFUL AND FRIENDLY CAMPSITE IN NATURE close to cycle paths. For ultimate relaxation on your holiday, we recommend that you bring your bike (if not, we have bikes for hire nearby, in the Loisirs Boulevard chalet at Navarrosse. 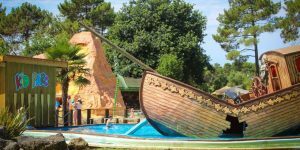 Next to the lake with large sandy beaches 900m away under the pine trees, easy to access on foot or by bike along the cycle paths through the Landes forest, with water sports clubs and small restaurants on the beach. Just 10km from the Atlantic Ocean, with its fine sandy beaches and waves, it’s paradise for surfers and the surf academy; Surf Gang Not to mention the night markets, where you can potter around every evening. 5600 hectare lake, ideal for all water sports for all ages. Relaxation, Fun and Thrills guaranteed with Aquapark, Oxoon, swimming lessons and stand-up paddle boarding in Port Maguide. Boat trips on the Lake with La Compagnie des Lacs. Seaplane Museum by Lac Latécoère, Biscarrosse being the seaplane capital. 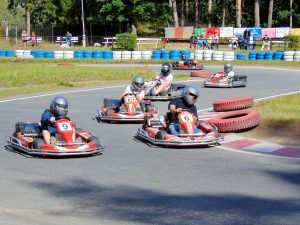 One of the biggest go-karting centres in Aquitane! The campsite’s location allows you to go to see amazing places and visit famous locations. Just a few minutes from your tent or your rented mobile home or chalet. The Dune du Pyla is a fantastic example of a must-see destination. To the north of Biscarrosse, admire the Dune du Pyla (or Pila). At 110m high, it is the tallest dune in Europe. Climbing up is a challenge, and can be tackled via various routes. At the top, admire stunning views over the ocean and enjoy stunning panoramas over the Landes forest. Another place to visit on your camping holiday: Bordeaux! The capital of Gironde is 1 hour from your piece of paradise, where you will discover a lively town with superb architecture, historic monuments and a unique summer atmosphere. Our campsite provides a great base, so make the most!